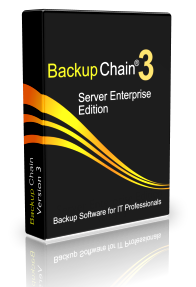 BackupChain is a physical server backup software specifically designed for IT professionals, giving you more control than any other Windows Server backup tool on the market. It creates robust file server backups, Hyper-V backups and VMware backups offering a full user interface even on Windows Core and Hyper-V Server installations. BackupChain runs on Windows Server 2019, 2016 to 2003 as well as on PCs (Windows 10 – XP). Full System Disk backup and disk cloning. Back up disks into a virtual disk format: VHD, VHDX, VDI, or VMDK. Copy disk to disk automatically on a schedule while Windows is running and without rebooting. Use P2P, V2P, V2V and the P2V converter to convert disks to virtual machines and vice versa. Live conversions of VMs into a new format, for example, from Hyper-V to VMware or VirtualBox and vice versa. Live Virtual Machine and Database Backup. Efficient virtual machine backups (for Hyper-V, VMware and other platforms) are created using delta compression while VMs and databases are running. File server backup: Copy and compress local folders, entire drives, and network folders to USB, external hard drives, FTP, and other PCs on your network. A wide range of compression formats is supported. Remote backup and cloud backup:Send your files to a remote cloud server on the Internet and access your files from anywhere. Advanced scheduling: Set it up once, and it backs up your files while you work. Full integration with VSS: Backup your databases and virtual machine images (VHDX, AVHDX, VHD, VMDK, AVHD, ORA, DBF, etc.) while running. Receive files over the Internet using the built-in FTP server. Configurable file version backup: select the number of file versions you want to keep depending on their file type. Multithreaded: run as many concurrent backups as you need. BackupChain can handle backups of millions of files without requiring a database to keep track of them. Full Unicode support: Non-English file names are fully supported. Runs unattended without login: Runs as a Windows service in the background. Easy to set up in five simple steps using the new Backup Wizard. In-file delta compression (deduplication) detects the changes within large database and virtual machine files and compresses them. Using delta compression, daily incremental backups of a 100 GB virtual machine may be reduced to less than 100MB, assuming a small amount of daily change occurs. Because in-file delta compression greatly reduces the storage required for a daily backup, you can send the daily backup over the Internet at relatively low cost. In addition, because the delta files are significantly smaller, they get transferred very quickly. You can set up your own online backup system by combining the in-file delta technology with the built-in FTP server and FTP client capabilities. BackupChain offers in-file delta compression. BackupChain offers Failover, remote storage, and cluster shared volume support. BackupChain includes FTP server and FTP client capability. You can send and receive your backups over FTP. Combined with delta compression, BackupChain is an efficient offsite backup solution for virtual machines and databases. Advanced Scheduler: Schedule backups to run continuously, hourly, daily, weekly, monthly, on selected days or weeks, etc. File versioning and version backup: specify how many versions you want to keep depending on file type. Standard compression formats: You can choose from a wide range of file formats, such as ZIP. This also ensures you can quickly access your backup on other, non-Windows Server computers. FTP Backup: Set up your own remote backup with BackupChain’s FTP client and server capabilities. Backup network folders: You can backup folders located on other PCs. CPU throttling: CPU throttling ensures your backup doesn’t use up all CPU power. Email notifications: Receive an email when and event occurs.